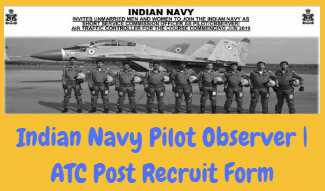 INDIAN NAVY (Nausena Bharti) is announced the notification form for Short Service Commission Officer as Pilot/Observer/Air Traffic Controller for course commencing June-2019. Those candidates who are interested and eligible may submit the application form 25th August 2018 to 14th September 2018. Eligible candidates can apply the e-application form through the official website of Indian Navy. For further details about the Indian Navy Recruitment June 2019 Batch like Eligibility Criteria, Educational Qualification, Age Limit, selection Process are given below. So candidates are advised to must read this article. First of all open the official website of Indian Navy given below. And finally, take a print of it for future use. Candidates should have passed in Engineering Degree or are in the final year of Engineering Course in any discipline from a recognized university / educational institute with at least 60% marks till 5th / 7th semester, in regular / integrated course respectively. FOR ATC POST – The candidate must have 60% aggregate marks in class X and XII and minimum 60% marks in English in class XII with above mentioned qualification. For ATC – Born between 02 Jul 1994 and 01 Jul 1998; both dates inclusive (Male or Female). For Observer– Born between 02 Jul 1995 and 01 Jul 2000; both dates inclusive (Male or Female). Pilot (MR) – Born between 02 Jul 1995 and 01 Jul 2000; both dates inclusive (Male only). Candidates will be selected through SSB Interview on the basis of performance in educational qualification. 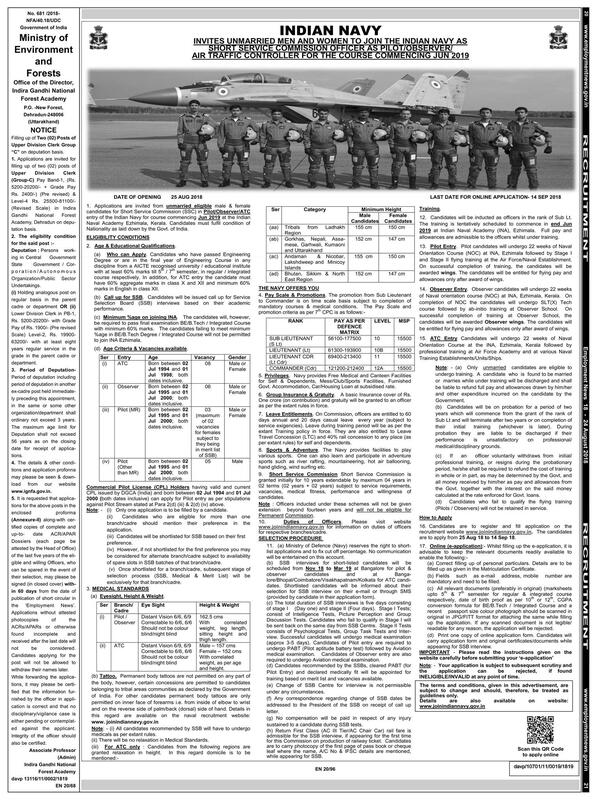 SSB interviews for short-listed candidates will be scheduled from Nov 18 to Mar 19 at Bangalore for pilot & observer. SSB interviews for ATC will be scheduled at Bangalore/ Bhopal/ Coimbatore/ Visakhapatnam. Selected candidates will be eligible for medicals examination (approx. 3-5 days). Candidates of Pilot entry are also required to undergo PABT (Pilot Aptitude Battery Test) followed by Aviation medical exam. NOTE: CPL (Commercial Pilot License) Holders having valid and current CPL issued by DGCA (India) and born between 02 Jul 1994 and 01 Jul 2000 (both dates inclusive) can apply for Pilot entry. Candidates will receive their SSB Interview Call letter through Post or Mail. Selection for SSB interview is based on performance in educational qualification. Those candidates who are eligible for post must carry your interview call letter at the time of SSB Interview.